my little red suitcase: it's coming.....! 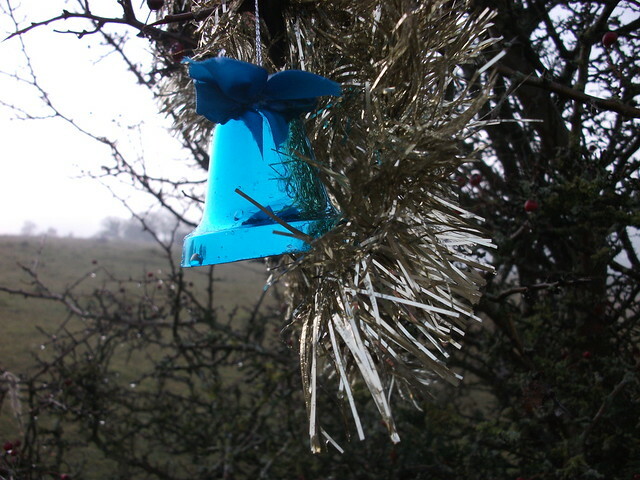 The first decoration on the dog-walkers christmas tree! has arrived. I love my morning walks here on top of the common with my little dog. Sometimes it's very blustery and at least 10 degrees colder than down below. We wrap up in woollens and head into the wind with our eyes watering. Little dog has decided she doesn't like wearing her coat anymore, more fool her! and here's the first doggy christmas card! There will be a box left under the tree, which is actually a hawthorne bush, for collections of food and money for the local dogs rescue. It's a well known sight around here, with people coming up to see it in all it's splendor later on. every day I admire this little tree as I come past. It has the most amazing backdrop of beech and birch trees down below. There's quite a high slope here, it's really so scenic. 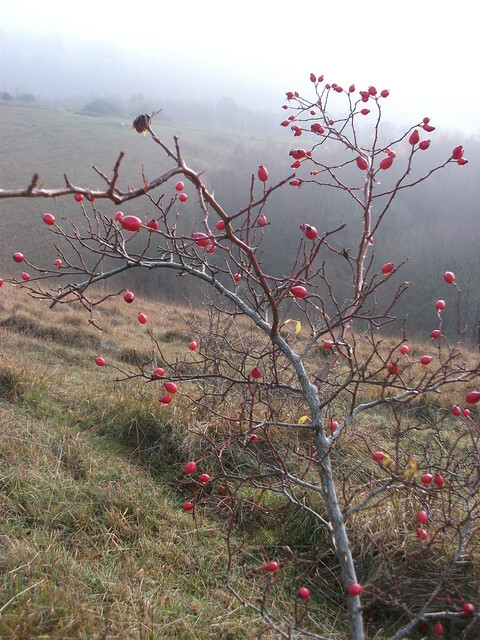 The red berries against the subtle misty winter landscape stops me in my tracks. My mornings are very different now. We haven't quite landed in a new routine yet, but they no longer look like this. In our town it's lovely to be out after dark now and see the lights and spot the houses on the way home that are all lit up. This is where the local skateboarders hang out! Flipping up and down the steps and around the pavement. 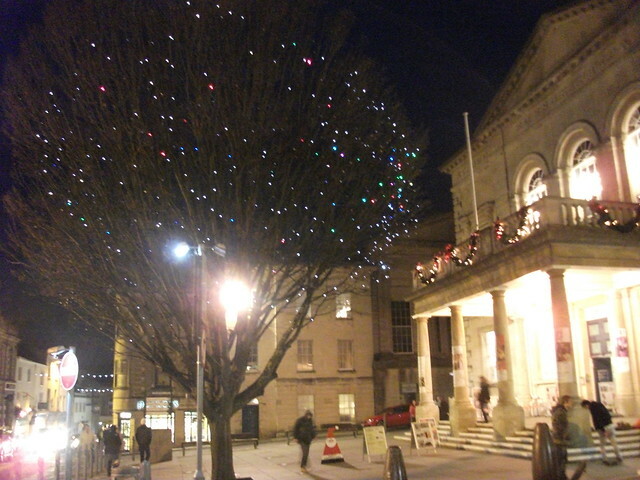 I expect I'll be down in the town several times this week buying last minute pressies! It looks quiet here now but I don't think it will next week. 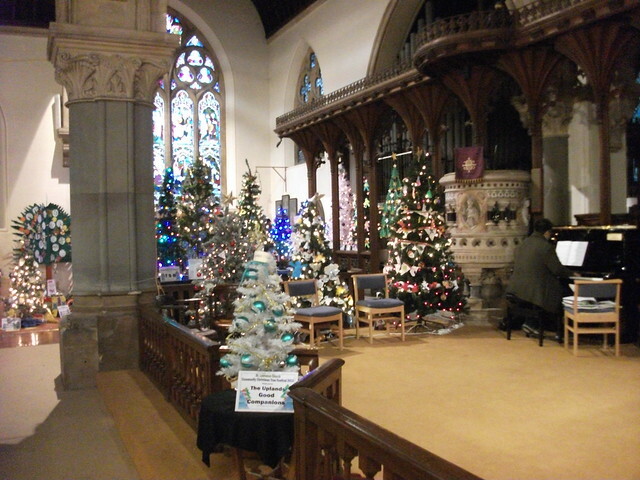 A quick peek in the church which has been decorated in trees by local businesses. 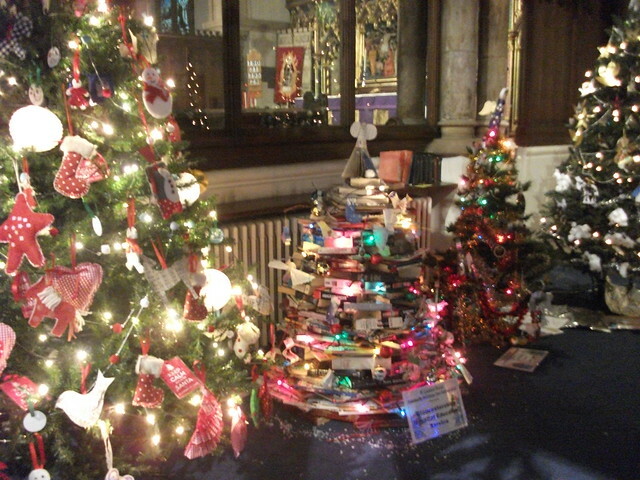 really I thought this one was very clever, A tree made from books! by the local hospital education. I have my little advent tree up now on my table, I can't find my advent star anywhere! I think the big tree will go up in the next couple of days. It's nice seeing bits of festive sparkle beginning to arrive. Oh and I have put up my rather lovely christmas fairy, she just needs a new bulb so she can do her glowy thing and then I will show you! and this is where it's all happening right now. 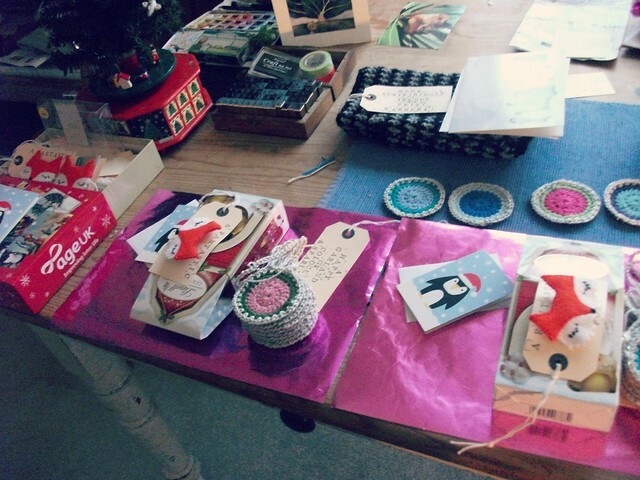 I little glimpse of sparkly projects as well. This year I have been using some coloured foil sheeting to wrap small presents, it's lovely. It's like wrapping with a box of quaility street sweets! Very christmassey, I think. And in case you need to know, last second class post is on Wednesday and last first class post is on Friday, in the UK! and to throw in some zen like thoughts, if it happens, it happens. If it doesn't forget it for this year! 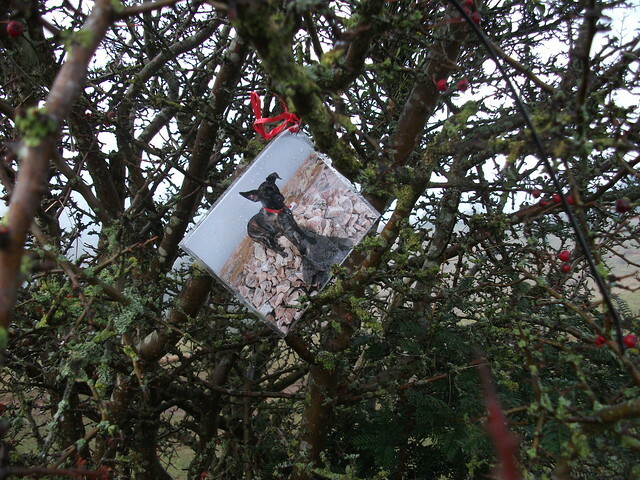 I like to see sweets things coming again, year after year, like your dogs christmas tree….. I feel at home, cosy and happy!!!! Hi Heather, I am so happy I found your blog again. I found you through the lovely Ms Joy at JoyJinks Creations. I just love your post today...very Christmasy!! 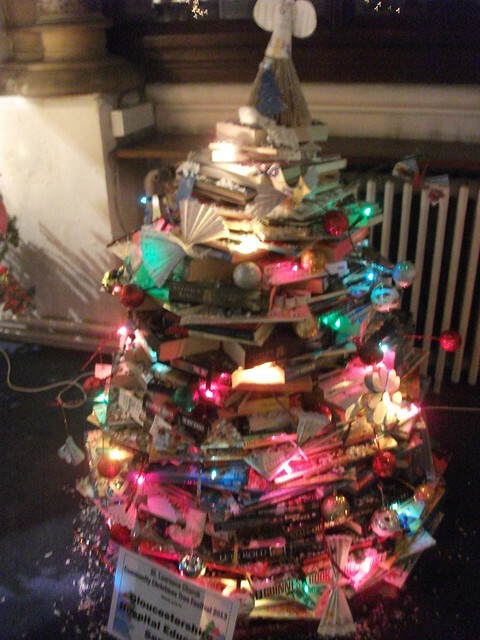 Really love the book tree-a very unique idea! Hi Heather, Love the doggy tree!!! Can't wait to see more of it!!!! I remember it from last year and I think it's a brilliant project!!! Your worktable looks so organized!!! I try and keep it tidy but by day 2 it's all just chaos, then I ignore it till I'm done and then I enjoy the big clean up!!!! 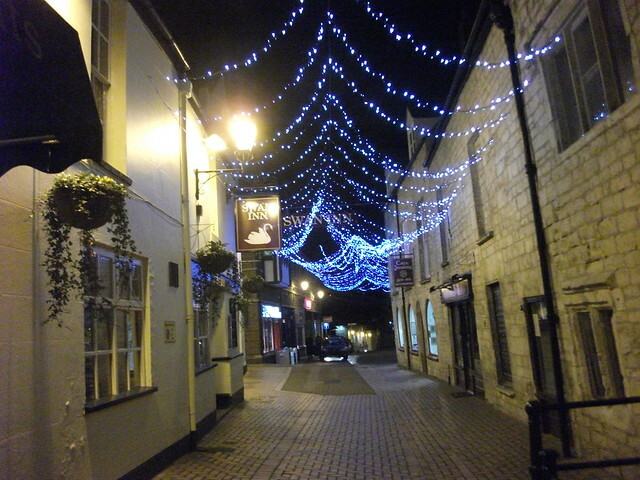 Looks very Chrismasy down your way and your little town looks just lovely!!! Have a great creative and happy week!!! That's a lovely idea of the tree, looking forward to seeing a photo at a later stage when more things have been added. Hope you have a happy Christmas.